Tourists photographed Mt Machhapuchhre from the Annapurna Base Camp as the last rays of sun hit the summit in a recent evening. 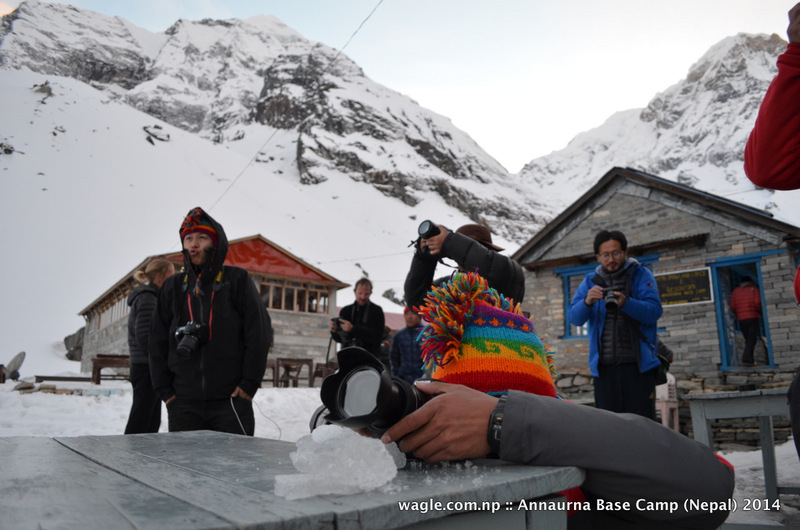 I went to the base camps of two of the best-known mountains– the Annapurna South and the Machhapuchhre (also known as Mt Fish Tail)– for the first time last week (11-17 March). Here’s what I saw and felt. 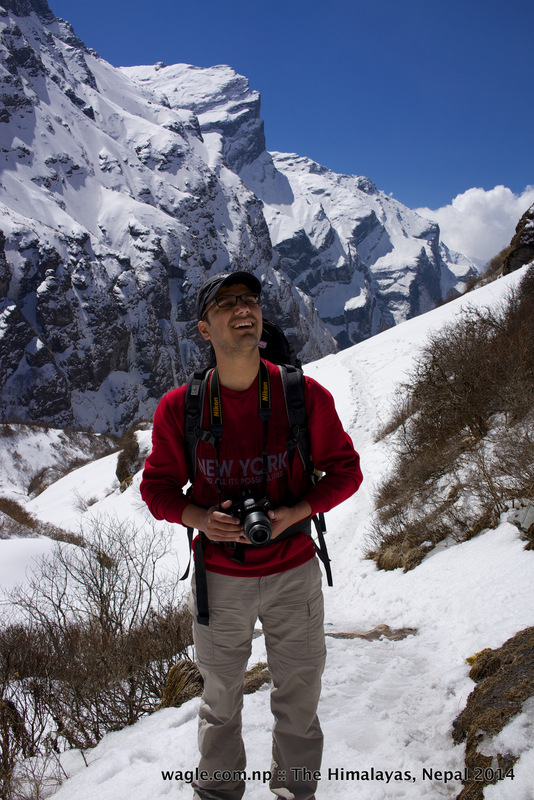 A Himalayan bowl: At the Annapurna Base Camp (4,130m, ABC) I felt like I was in a huge bowl. There were snowy mountains on all sides- their heights ranging from 8091 m (Annapurna-I) to 5,663 (Tharpu Chuli aka Tent Peak). They didn’t look very far. The 360-degree view of the Himals was spectacular. Mornings and late afternoons offered some of the best and dramatic views of mountains. 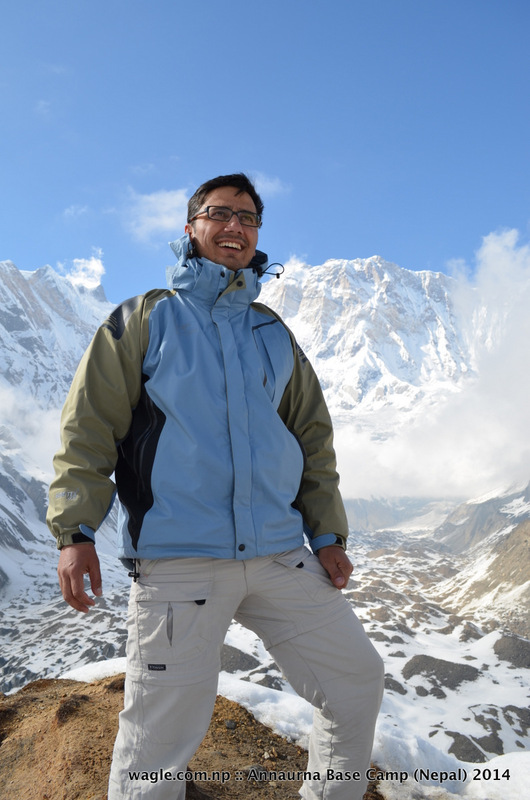 Around noon was super hot– so much so that I encountered a bare-chested foreign trekker as I was heading up to ABC from MBC (Machhapuchhre Base Camp). It looked as if he and a bare-armed woman in shorts who was walking behind him weren’t worried about being sunburned. Around mid-day was the time to take nap and rest as the unforgiving sun made it almost impossible to walk around and watch the mountains. Moreover, I wasn’t feeling particularly well. I had a mild headache and caught cold. Fortunately signs of altitude sickness disappeared after a couple of hours of rest. I experienced the difficulties despite spending 22 hours at MBC (3700 m). Sun caste its first rays of the day over the summit of 8091 m Annapurna I. Weather conditions determine view in the Himalayas.Weather was fine when I was at ABC. Same was the case in Langtang when I was there in 2003. But lack of rhododendron flowers in the ABC trail was a big disappointment. Sunrise and sunset comprised the best parts of the morning and the evening views during fine weather conditions. Interestingly both sunrise and sunset couldn’t be seen directly. Some of the first and last rays of sun reflected beautifully on Annapurnas and Machhapuchhre (6993 M) respectively every morning and evening. Both occasions looked stunning. I saw that some trekkers didn’t stay overnight at the ABC. They did so at MBC and went for a quick morning trip of ABC. Some trekkers, however, did a day trip to ABC from MBC and went there again the next day to spend a night. I thought it was good to stay overnight at ABC. MBC is just a shadow of ABC so one shouldn’t expect any great views of the mountains from there though the lodge where I stayed advertised itself as the sole spot from where Mt Gangapurna could be viewed. But MBC offered a beautiful view of the narrow valley through which Modi Khola river flew down with the Mardi Himal ridge standing on its left and the Hiunchuli ridge (or, parts of the landmass that served as base for Hiunchuli, 6,441 m) on its right. The trekking trail between Deurali and MBC briefly crisscrossed the Modi Khola river because of an avalanche on the Hiunchuli side as it approached MBC. The view of Machhapuchhre itself from MBC was no less than disappointing. It was as if you were exposed to the dark secret of otherwise super attractive and distinct peak that you always admired from afar– including while boating in the waters of lake Fewa in Pokhara where people often photograph the beautiful reflection of Machhapuchhre peak. What I saw of Machhapuchhre from MBC was an uninspiring and bare rock that was bereft of snow. It was so steep that it had neither any capacity to hold snow nor it provided me with any space where I could base my imaginations. It didn’t inspire or provoke me like many Himals often do. Some might find this a rather harsh assessment but, to be fair, the same mountain looked much more affable, beautiful and admirable from ABC. The bare and steep rock that dominated the view from MBC lost its prominence– a big relief– when I looked at it from ABC. I saw more snow and other parts of its enormous and attractive body. 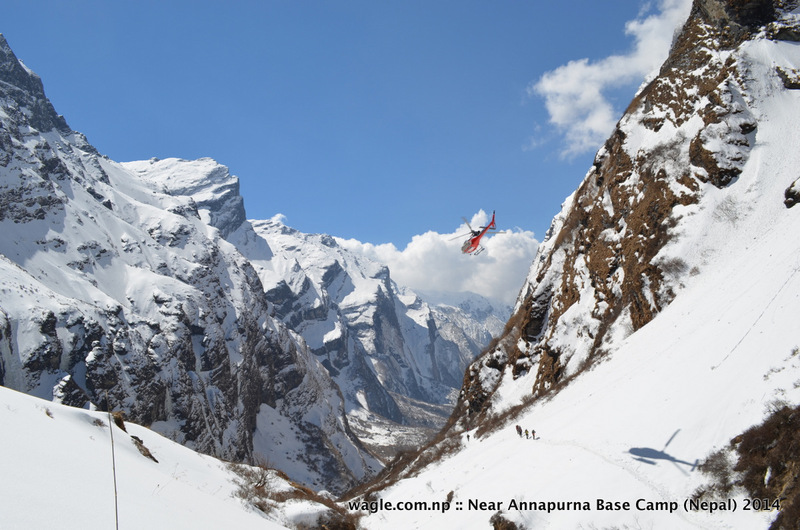 Both Annapurna South and Annapurna-I looked very close and imposing from ABC. It felt like I could reach at their summits if I walked for a couple of hours. Or, quicker if I ran. But at 4,100 meters above the sea level tall gaps existed between what you could do in your imaginations and in reality. While I was inside the bowl called ABC, I couldn’t help but organize an imaginary beauty contest among the mountains and peaks that were visible from there. In my judgement, Machhapuchhre easily walked away with the crown. 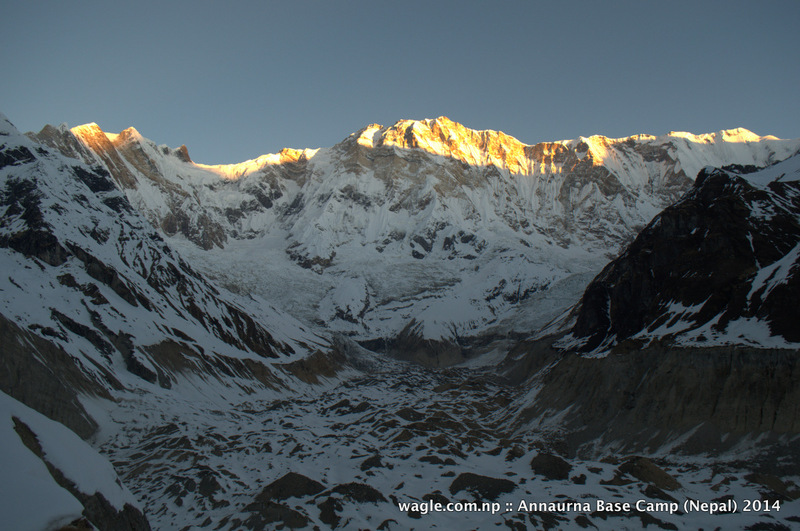 To be fair, both Annapurnas looked more colorful and had distinct patterns of snow and shiny brown and mild dark rocks during sunrise. But they lacked the distinct shape and character that Machhapuchhere had. 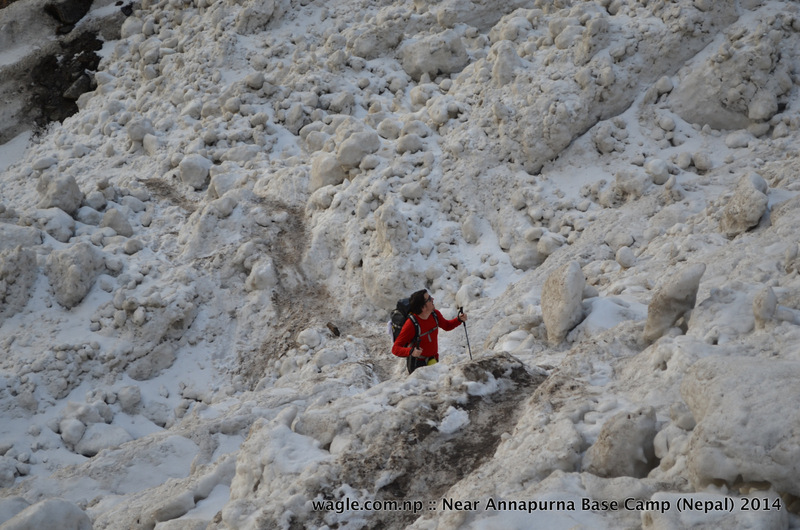 A trekker walked through an avalanche near Deurali– about 1.5 hrs walk from Machhapuchhre (Fish Tail) Base Camp. 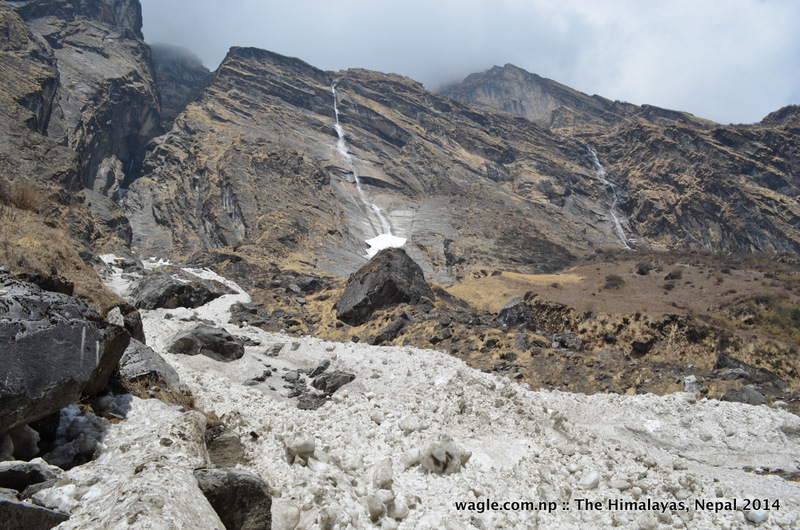 Avalanches: Being in the Himalayan bowl was as mesmerizing as seeing and walking through the avalanches. I came across a massive but old avalanche just before a place called Deurali that can be reached by walking for about eight hours from Chhumrung village– the nearest proper human settlement from ABC. Initially I thought it was a huge debris of sand, soil and rocks covered by frost or old snow– a landslide covered in snow. But I was stunned to realize that it was nothing but snow and ice. Big objects that I had mistakenly thought to be boulders were ice balls. A small temporary trail passed through it. All that had come through a small crack between two huge rocky hills that formed parts of Hiunchuli peak. From the safety of a lodge at MBC, I saw several live powder snow avalanches. They were small but even then I didn’t want to be anywhere near them. They resembled waterfalls except that what was flowing through the rocks was not water but snow. The visual element was less dramatic than the noise that they created. Somewhat similar to thundering and popcorn popping. I heard such noises as soon as clouds started gathering over and around the peaks. The acoustic atmosphere created by the combination of snowfall and rockfall was more dramatic in ABC bowl. The constant noise made me feel I was in a place that was very unstable. It gave me the sense that things were falling apart. The mountains were unraveling with every passing minute. I will not talk about the ABC trek itinerary as there are plenty of websites that provide details of that. But I will add that there’s nothing remarkable about the walk up to the avalanche near Deurali– it can be anywhere in Nepali mid hills though the view of Machhapuchhre, unavailable in many other similar trails across Nepal, is distinct and it kept me moving upward. I reached MBC in two hours from Deurali (and that’s normal). Compared to many other non-commercial or less commercial trails in Nepal, the hoteliers– mostly Gurungs– were exceptionally money-minded and, at times, discriminatory and racists. Foreign trekkers were given undue preference over Nepalis in many lodges and dining halls not because hoteliers liked or loved them. The lodge-owners believed foreigners would spend more money than Nepalis which was not always the case. In fact same story can be heard in trekking trails of Langtang and Everest regions where Tamangs and Sherpas run most lodges. The Modi Khola river valley, as seen from Machhapuchhre Base Camp, with snow-capped Mardi Himal on the left and part of Hiunchuli peak on the right. Rays of sunlight hit the western rocky face of Mt Machhapuchhre (Fishtail) as the moon rose from the east. As seen from MBC. Lodges at the Annapurna Base Camp. Hidden in the clouds is Mt Machhapuchhre. ABC view point on the ride on right. 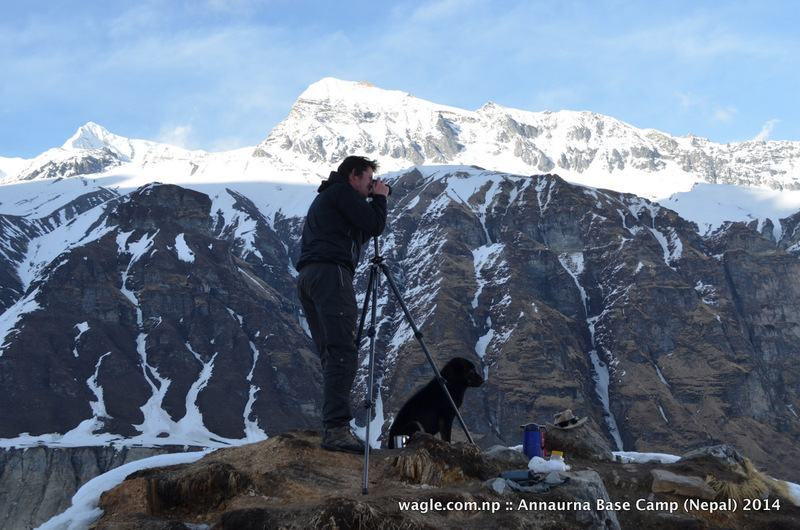 A trekker returned to lodges at ABC after roaming around near Annapurna South. Spot a dog. Tourists photographed Mt Machhapuchhre from the Annapurna Base Camp as the last rays of sun hit the mountain in a recent evening. 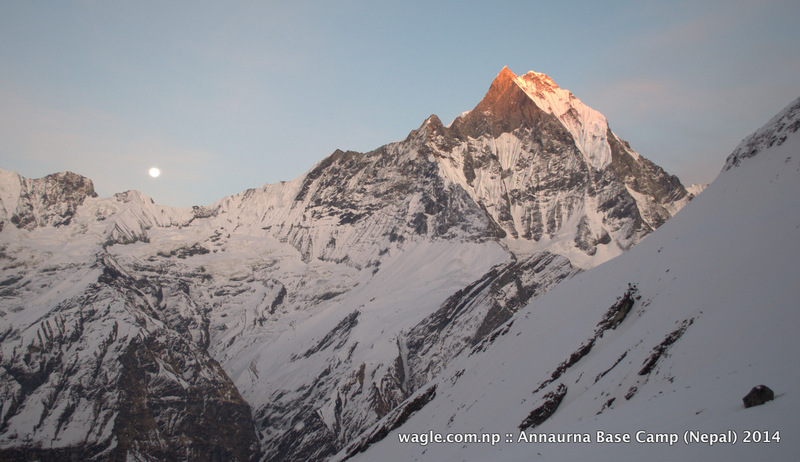 First Rays Of the New Rising Sun on the Mighty Annapurna: Sun caste its first rays of the day over the summit of 8091 m Annapurna I. College boys from Kathmandu carried the national flag as they headed towards MBC aiming to reach ABC. Here’s the story: Slipped from the rock where the tripod’s standing, dipped the right leg in cold water, fortunately didn’t fully go into water, walked for half an hour in wet shoe– then it dried.